I saw CM Taylor (aka Craig) deliver a workshop on Character is Destiny at the York Festival of Writing and was hooked on the ideas he introduced in it. So much so that I invited him to come and teach an expanded version at a retreat. The Character is Destiny Retreat took place in March 2017 and there were two 3-hour workshops expanding on the ideas that intrigued me at York. Delighted to have Craig here on the blog today talking about character development and the transformational arc. Craig, you co-wrote a horror film that’s coming out soon about writers retreating to a remote island and terrifying things happening (I’m sure our retreat won’t be like that!) – can you tell us how writing characters for the screen and novels differs and also how and where it crosses over? Yeah, that’s correct. The thing which makes a writers’ retreat an apt subject for a horror film is the same thing which makes it appropriate for advancing yourself creatively. You take yourself out of a normal environment, and put yourself in a situation where you can go into yourself, and, with the help of others, engage with your emotions and creative truths. But about characters, and how writing characters for screen and prose differs, well, one of the main differences I would say is that in screenwriting you need to leave room for the actor and the director. In prose, you are the writer, the actor, and the director, and how you portray the character is the totality of that character’s portrayal. Whereas with screen, you are merely providing the ingredients which the director and the actor will cook up between them. You need to leave room for actors to act. Plus in screenwriting you work a lot with sub-text. For example, the character can say the opposite of what they really feel and the actor’s face will convey this duplicity and conflict. Like in a film someone can say, “Yes, my Lord”, but their face and tone and body-language can mean, “I will kill you tomorrow.” So in screenwriting you don’t write the, “I will kill you tomorrow” bit, but in prose you kind of have to, because you do not have a twenty-foot high actor’s face to show the concealed meaning. So prose is more of a spoon-feeding kind of medium in a way, the sub-textual elements are fewer. Now, there is all this stuff in creative writing teaching about showing not telling, and prose writers can learn a lot from screenwriters about that skill, but fundamentally, prose is obliged to be a slightly telling sort of medium. The kind of radical, bone dry showing-only that screenwriters trade in will just not work in prose. The reader does need to be told a little bit. The unique strength of the novel as an art form is that it can slide behind the eyes of a character in the way that other mediums can’t. We can fall into the mulch of consciousness in the novel. It it is the closest thing to mind-reading humans have invented. Yet. So it’s concerned with interiority and the depiction of moment-by-moment consciousness in a way which the screen is just not. We can say almost exactly what is happening in the mind of a person in prose. But in screenwriting we have to convey what is happening in the mind of the person only through those things which can be seen. Actions, speech. Music can hint at unseen feelings too. And there are the techniques of voice-over, or a character writing a diary, say, or something of this nature. But in terms of the narrative arts, the totality of the un-mediated interior life is available most directly in prose. The similarities between the two forms of narrative art is that their subjects are themselves subject to the same forces. In the novel and on screen, character is subject to the forces of personal history, subject to the forces of relationships (love, family, tribe, work), subject to the forces of the wider world, (what we might call history or society or war or the environment), and, (although many stories leave this aspect out), they are also subject to cosmic and religious impulses. Those are the four nooses which story tightens around a protagonist. So in both screen-writing and prose writing these same existential human pressures come to bear. And the goal of the writing is the same, to show a person in the grip of events and time, and to show how they change or do not change with regard to their experiences. That really is narrative art. The depiction of the effects of time upon life. The focus for this workshop is all about creating an emotional transformational arc for your characters alongside the main narrative arc and plot – can you tell us why you think this is so important to master for novel writing? Well, psychologically, I think that there is a profound, subconscious, didactic element to stories, and the reason why we consume them with such unrelenting gusto is because they teach us how to live. We see a character in a transitional moment in their life, we see a character forced by life to make a tough choice, and we are desperate to see what they will do, so that we can judge if we would have done the same, so we can judge how different they are to us, or how not different at all. We gulp down story so that we can see how characters negotiate the changes and horrors of life which await ourselves. On a subconscious level, characters are our avatars whom we scrutinise for advice about negotiating painful change. Stories are wiser than their tellers. They are our elders. But as to why transformational screenwriting models of how best to depict moral and emotional change – be that heroic or tragic change – in narrative art are particularly pertinent to prose writers, well, a lot of writers of prose are perhaps overly attached to individual words and sentences, and paragraphs, at the expense of scenes and sequences and plot outcomes. Screenwriters think more structurally on the whole. Prose writers tend to be hacking through the story jungle with a machete, while screenwriters are above the jungle in a chopper, burning that mother down. And I think if you were to honestly recall a favourite novel, years after you have finished reading, what you would probably remember is the fate of the character, or an amazing scene. In short, what happened to them. How they struggled under which forces. The beauty or not of individual lines, or words, or purple passages, while perhaps paramount to the writer when they are writing, is not that which most readers take away. Narrative is concerned with fates, with what happens to a person when they are put under certain pressures. The pattern of choices a character makes which taken together results in a fate. So it is very important for writers of prose to deal with structure, to understand the underlying shapes of structure. And that’s where I go to screen-writing to steal that structural knowledge. There is without question an underlying structure to narrative art, in particular in the instance we are talking about here, with regard to how characters can be shown to change or not change under external and internal duress over the course of a story. There are real, teachable working models for this. Which novels do you think have nailed this and why? Well first of all, different types of novels, different genres of novels, deal with this in different ways. A geopolitical thriller will not trade in heavy emotional transformation, but if it wants to hook more readers in, readers who are interested in human meaning and not just the mechanics of plot, if it wants to add feeling to action, then it can in some unobtrusive simple, structural way deal with emotional transformation. Similarly, a literary novel may be almost exclusively concerned with the emotional development or transformation of the hero or heroine. There’s a whole genre of this – the bildungsroman, the novel of spiritual progress. So any genre can trade in the transformational arc. A couple of novels I love that work well on the scale of human transformation and in very different ways are Staying On by Paul Scott, and The Van by Roddy Doyle. Now The Van is a work of humorous social realism, set on a working class estate in Dublin and it concerns male friendship. Two unemployed guys, listless, low in self esteem, decide to set up a fast food van to sell to people coming out of the pubs after World Cup games. Brilliantly simple. Now because it is working on the level of social realism, the transformation here is going to be similarly realistic and small. We are not talking Macbeth here. So, through running a chipper with his mate, the main character gets the respect of his wife back because he’s been active not passive, and he loses his friendship with his partner who becomes bullying and domineering, and he gets his own self-respect back because he’s done something. So it’s a very small plot. But it takes our hero from a passive moment in his life, through to a wiser sadder place where he holds knowledge of his friend’s character, but where he has a better marriage and more self-confidence. An irreversible change has been made in his character. It’s brilliantly done. Now in terms of emotional change, Paul Scott’s Staying On concerns a timid wife, obliged to stay on in colonial India by her stubborn and uncommunicative husband. Now in the story he ultimately dies – in fact it is stated on the first page that he does – leaving her stranded. But he is ill first, and during the course of the illness she establishes a timid – to some extent imaginary – relationship with a friend from England, allowing her to confess her difficulties with her husband, and she works up the nerve to force her introverted husband to finally state their financial realities. So that is again played out on a very micro level. Yes, the illness and then death of the husband is the huge external thing, the change, but the real meat, the emotional transformation, is internal, and comes from her pursuing a friendship in which she is able to gain support for her neglected emotions, and being able to ask her husband for some financial accountability which she never has felt entitled to do before. So she is bereaved and stuck but emboldened at the end. It’s a beautiful book. What can the writers who take this workshop with you expect to learn? Well I aim for very practical outcomes. 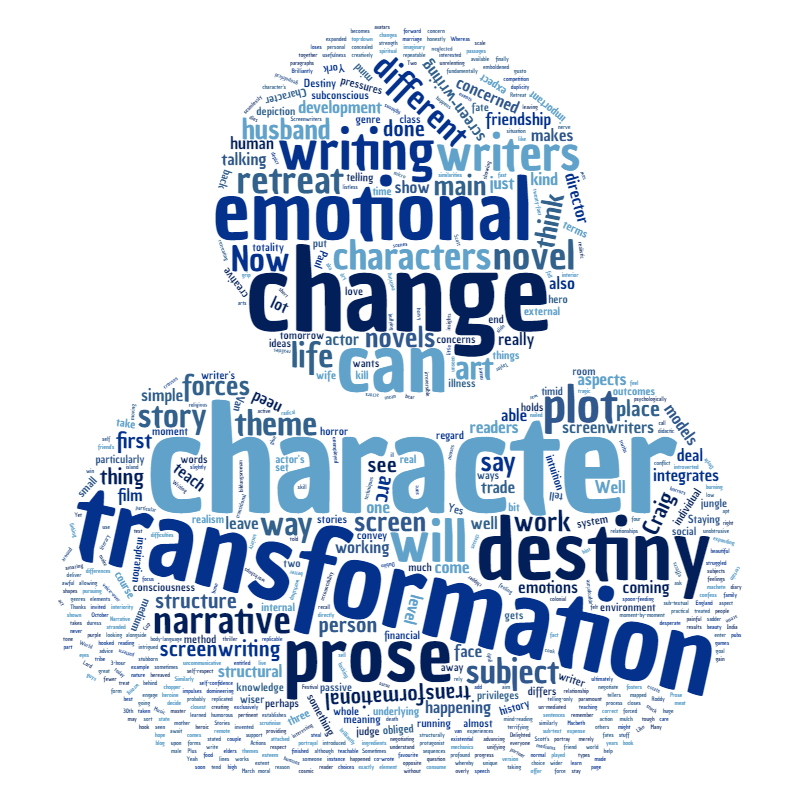 There is a method that I use which fosters a writer’s theme, what they care about most, integrates that theme with character transformation, and then integrates character transformation with plot development. So the three main aspects of narrative art – theme, character and plot are all treated as part of the same moving concern and the same evolving structure. And it’s done in a way which privileges theme, and in such a way that character change is the glue which holds theme to plot, and we treat character change as a process which can be learned and mapped and replicated. Many models of story are top-down, plot first, and they have their place, but the one I teach here is particularly interesting for prose writers because it privileges the writer’s emotions and themes and seamlessly integrates those with the structural aspects of writing. So what I expect everyone in the class to be able to do at the end of this retreat is have a replicable system of linking theme to character to plot. Now intuition can be great, but it can also be awful. Sometimes if you rely on intuition and inspiration you will be right and sometimes you will be wrong. So what I hope to do is offer a simple, repeatable method whereby you can test the usefulness of your inspiration against a system for unifying the three main aspects of writing. Can’t wait! Am also sharing!